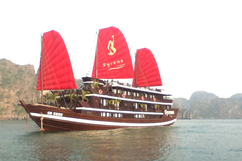 Built in accordance with traditional Vietnamese style and modern-day luxury, Syrena Cruises have maintained the original standards of luxury cruising in Halong Bay with the current Syrena Cruises boat entering service in autumn 2010. 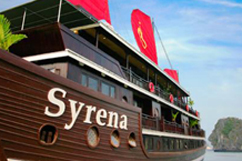 The Syrena Cruises fleet of 2 boats offers a total of 34 luxury cabins & suites accommodating a total of 68 passengers for Halong Bay cruises or hosted events (weddings, corporate retreats, incentives, meetings, conferences, etc.). 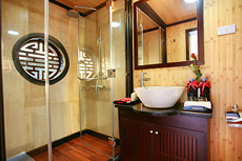 All Syrena Deluxe cabins and Suites are well appointed, with traditional Vietnamese hardwood creating lavish warmth. 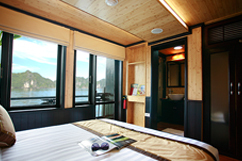 Light materials and clear windows ensure that each cabin is bright and airy. 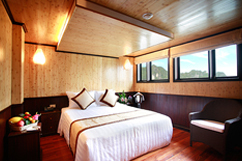 Hand-crafted furniture and delicate upholstery further enhance the warmth and light in each cabin. 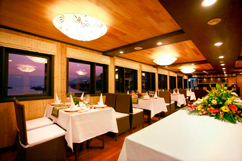 Reflecting the modern & traditional cultural influence of Vietnam, the menu in this restaurant offers our guests Vietnamese to International cuisine. 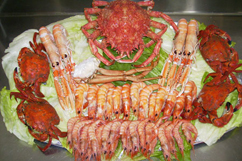 Feasting in this restaurant enables one an aromatic & exceptional opportunity to taste and experience the cultural and food traditions of both worlds. 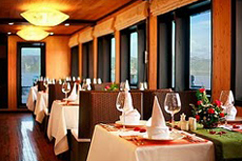 Aside from these exquisite offerings and an elegant atmosphere, the Lotus Restaurant also hosted many presentations or meetings, parties or weddings, etc. 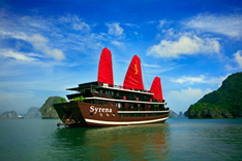 Swimming, snorkelling and kayaking in the crystal waters of Ha Long Bay are favoured activities for the energetic while morning Tai Chi on the sundeck offers a meditative and uplifting start of the day. 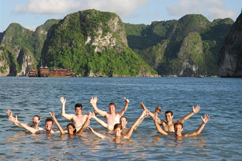 Adventure outings, tour excursions and cooking classes are also available on board.